Liquid Media Chairman, Joshua Jackson; StratusCore Co-Founder and CEO, Denise Muyco; Co-Founder of Liquid Media, Daniel Cruz; and Liquid Media Director, Charles Brezer. StratusCore, Inc. today announced a strategic partnership with Liquid Media Group, Ltd. (NASDAQ:YVR) under which Liquid Media will drive the operations and distribution efforts for both purpose-built production facilities and easily accessible artist-ready co-work facilities that deliver StratusCore’s Virtual Studio service to artists and content developers everywhere. 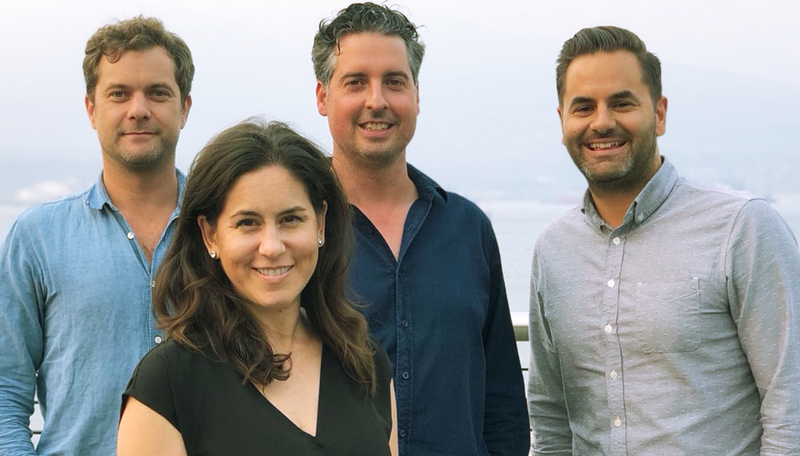 In connection with the partnership, Liquid Media has made a strategic investment in StratusCore to support the growth of its operations. Under the agreement, on a moving forward basis, Liquid Media will be taking a leadership role in managing the existing network of facilities currently carrying the Powered by StratusCore™ certification — which has hosted and hosts such powerhouse-companies as Netflix, Sony and Amazon Productions including their network of related production companies. Additionally, Liquid Media will drive further expansion of these certified facilities in North America, Europe, Asia, and other selected media markets. StratusCore’s Virtual Studio suite of advanced cloud-based tools are used by creative professionals in all phases of film, television, gaming, animation, and advertising content production and post production. “We are genuinely excited about our relationship with StratusCore to directly address the $20 billion content-creation services business. Together, StratusCore and Liquid can facilitate efficiencies in content creation and continue to push the art of the possible,” said Liquid Media Chairman Joshua Jackson. “We’re eager to take the operations of StratusCore’s Virtual Studio platform to global media markets. We are well positioned with deep experience in the retail, real estate and the media and entertainment industries respectively,” adds Charles Brezer, Director of Liquid Media. Liquid Media is a vertically integrated global studio producing content for all platforms including film, television, gaming and VR through its network of shared services and facilities. With an extensive network of industry executives and financial partners, Liquid Media innovates and delivers creative content from inspiration through to distribution. StratusCore is a content production technology company that is moving digital content production into the cloud. StratusCore removes complexity and inefficiency from the data-intensive digital content creation process with on-demand tools, services and community connecting artists and productions. StratusCore’s Virtual Studio is a virtual workspace where creative professionals connect with collaborators on projects using powerful, industry-standard production tools securely in the cloud. Digital artists gain affordable access to popular content creation tools and exposure to more jobs, while productions and studios gain superior control and protection of all assets and resources. Its suite of industry-compliant services includes content creation tools from companies like Adobe® The Foundry™, NVIDIA®, and Chaos Group on a pay-as-you-go basis, virtual workstations, high-speed file transfer, secure storage, cloud render, remote collaboration, and role-based services provisioning. StratusCore consolidates currently disjointed processes into an elegant online dashboard and allows productions and artists to collaborate in a secure private or public cloud environment. StratusCore’s community of artists connects talent with productions at a moment’s notice. StratusCore’s clients include some of the world’s largest traditional studios like Sony and Universal, new OTT content providers like Netflix, gaming and post-production VR / VFX houses like Sony Interactive and educational institutions like NYU. For more information, please visit StratusCore.com.